Photographer Carly Bish never fails to capture my heart with her work, I love her fun yet romantic style when it comes to her photography and I can tell you that Elle & Connor’s engagement shoot is no exception! 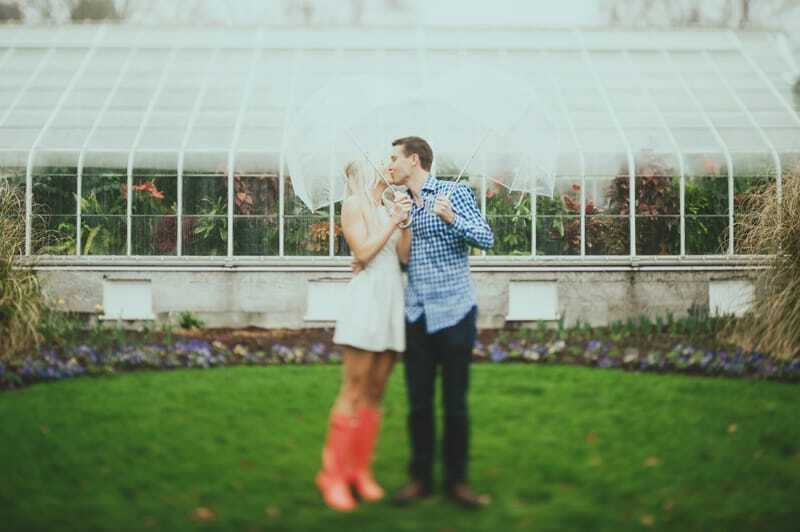 This awesome couple embraced the fact that it rained on the day of their engagement shoot and said they’re lucky to have a relationship where they find humor and joy in odd circumstances! That truly is the best attitude to have and sometimes you just have to laugh, these photos have turned out so beautifully because of that! “Conor and I first met in high school on the ski slopes. Our groups of friends had merged together and we became fast friends who always had something to laugh about with each other. It’s safe to say he’s been making me laugh for over a decade. Although we had a couple false-starts with dating, it was 10 years after we first met that we fell head over heels for each other. After two years of dating and many, many shared jokes with each other, Conor popped the big question. It was such a beautiful day in the Pacific Northwest, we ended up going for a walk around a lake that is right next to our house. I didn’t notice anything out of the ordinary; Conor later told me that he had been avoiding walking too close to me in case I noticed the ring box in his pocket. Towards the end of our stroll we sat down next to the water to soak up the sun. (I also really wanted to show Conor a YouTube video that I’d been yammering on about during our walk.) After sitting for a couple of minutes Conor turned to me and asked me my favorite question that I’ve even been asked, “Will you marry me?” I was so surprised and caught off guard that I whimsically shouted, “Holy sh*t…YES!” In typical fashion, we laughed together. Such a cute engagement shoot, the weather makes it even more romantic and I love that moving image!